“Don’t make that face, it’ll stick like that!” Your mom must have said that to you a million times, right? It’s not true but I bet you uncrossed your eyes and relaxed your puckered mouth. If you’re as gullible as I am it wasn’t until you had kids of your own before you realized that your mom was wrong, and little kids making funny faces is actually pretty entertaining. The developers behind Party Face! think so too. 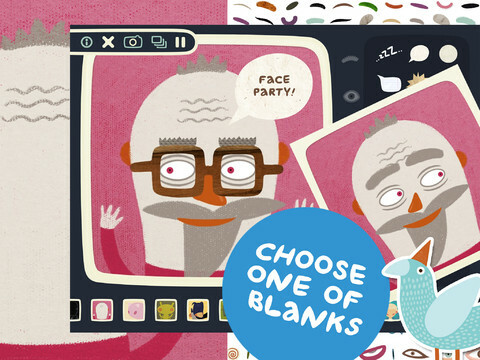 Using a range of faces and features the app allows kids to customize their artwork, from eyebrows to chin. 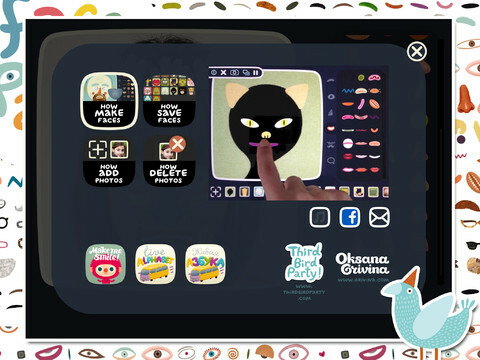 They can then save their creation to the iPad and share it via e-mail – maybe Gramma needs a reminder that funny faces are just fine. Blank faces range from kittens to hair-covered Cousin It-type characters. 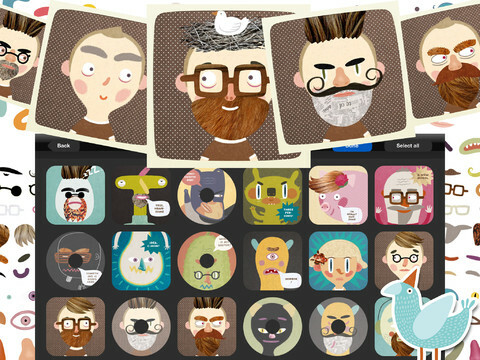 There are eyes, noses, mustaches, and face accessories of all kinds. The stickers can be rotated or scaled up and down. Your kiddo can even use their picture from the iPad gallery or take a new one – the results are pretty hilarious. Seeing as how my kids love playing Squishy Face (don’t ask) I knew they would really like this app. Party Face! did not disappoint, and after going through all of the pre-animated faces they took turns capturing each other. There were video tutorials to help them and no written instructions to slow them down. For $0.99 this app is a whole lot of funny faces for a small price. Party Face! will surely make your little one smile – it’s fun and easy to use, and it’ll help debunk all of those parenting myths that you’re still unsure about.